If the answer is “yes” to any of these problems, your shower needs to be Re-sealed! Ignoring these signs of trouble could result in even greater damage and much more expensive repairs. Or if you know you have a problem and haven’t found the right tradie to do the job, call Re-seal. We’ll quickly find the leak without damaging your bathroom any further – saving you time and money. A fast and effective solution to your shower or bathroom problem. A shower that sparkles and will look almost brand-new. A Re-seal that lasts, eliminating the need for a major renovation. Wasting money trying to sort out the problem. Wasting time trying to scrub away shower mould. Worry about the damage your leaking shower might be causing. 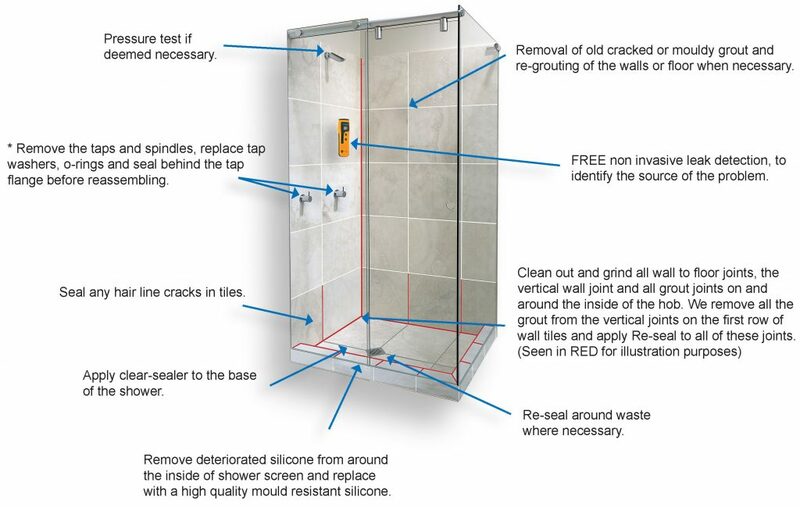 Discover How We Can Repair A Leaking Shower Without Retiling.